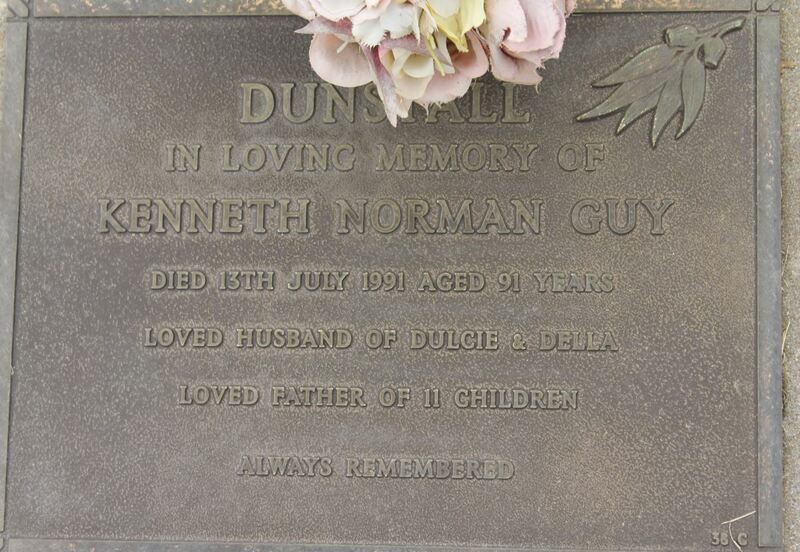 Kenneth Norman Guy Dunstall was born in Boulder, Western Australia in 1900. His parents were Herbert Dunstall and Alice nee Head and they lived at Lake Darlot in the Western Australian Goldfields. The township within the district of Lake Darlot, later known as Woodarra, was about 420km north of Boulder. I have not discovered when Herbert and Alice first moved there. 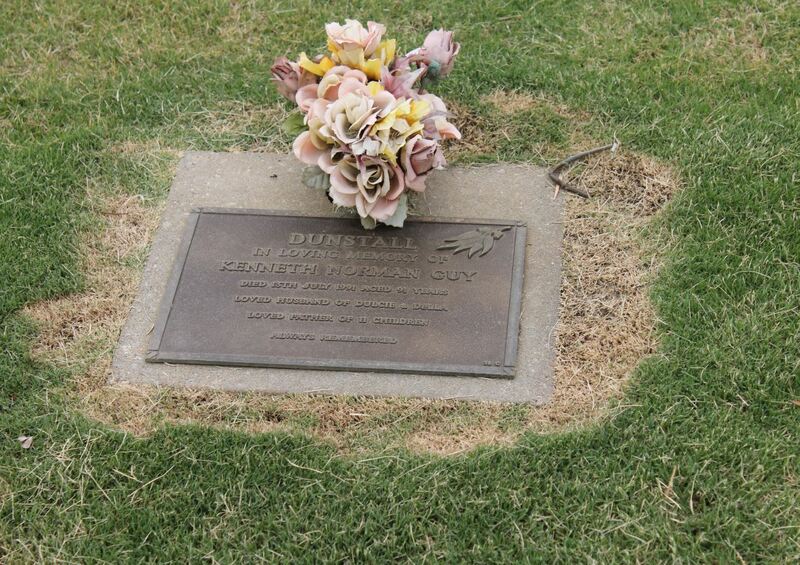 Herbert was only ten when his father died in Warooka, South Australia, and he was fourteen when his mother died. The family story has it that the children went to the goldfields after their parents died, so possibly he was out there as early as 1887. Gold was discovered in the district of Lake Darlot in the 1890s and undoubtedly this is what drew Herbert to the area. There was the usual rush of men seeking to stake their claims but by 1895 newcomers found they were too late. “There are 2,000 alluvial men on the ground, a good many of them with machines, but they do not make on an average more than three penny weights a day, although some of them, of course, do a lot better. Mr Gregory (local property owner) ‘would warn alluvial seekers not to go to the field at present, on account of the great number already there. Waggons are of little assistance in travelling, the best means of locomotion being by camels or pack horses. There is splendid grass on the banks of all creeks on the road to the field, and the country is very auriferous. Kangaroos, emus, ducks and turkeys are to be seen in the vicinity. The best road to the field is through the 90-Mile, past the 16-Mile condensers, by a well-beaten path, thence a few points east of north, passing Sandy Creek rocks, Granite rocks, Doyle’s well (Fermanent), and Wilson’s creek. “Lake Darlot News.” Western Argus (Kalgoorlie, WA : 1894 – 1896) 27 Jun 1895: 4. Web. 16 Dec 2014 <http://nla.gov.au/nla.news-article33799505&gt;. So if the rush was over by 1895, why did Herbert and Alice go there? For Alice, I now think I can guess the answer. From my investigating and questioning this week, I learned that Alice was a very able businesswoman. She and her sister came out as single girls in 1896 from Richmond, Surrey to be domestic servants. Alice was aged 20 and the change from urban British Richmond to outback Western Australia was very extreme. Alice found work in Boulder in a boarding house, and it must have become apparent to her that there was money to be made in such an enterprise. I don’t know if she placed much faith in the results of mining, but she certainly noticed that any goldfield would bring travellers who required accommodation. She and Herbert Dunstall married in 1899 in Boulder City, Western Australia. News has just come … from a friend who is on a trip to Lake Darlot. He states that 22 camels and 34 men Ieft Coolgardie on 16th April, arriving there on the 10th May. Carriage of provisions cost 3 pounds 15 shillings per cwt. There was a dry stage of 90 miles to travel, water being bought from the camel driver at 1 shilling per gallon. Thirty miles from the field the party was delayed two days on account of the rain. On arriving at the field men came running to meet them, asking if they bad provisions for sale, as the camp was nearly starved out. Many men were met coming back, and gave such a bad account cf the field that some of those going up went back almost immediately. It is simple madness, continues the writer, for any one to go to Lake Darlot, and he asks that his letter should be made use of so as to discourage anyone if he feels inclined to go to the field. “LAKE DARLOT.” Western Mail (Perth, WA : 1885 – 1954) 28 Jun 1895: 8. Web. 16 Dec 2014 <http://nla.gov.au/nla.news-article33116072&gt;. There were so many of these settlements in this time period, where gold was discovered and the town came rapidly into existence. Some, like Bendigo, were able to support the intake and boomed. Others failed miserably in the first few years. In 1895, the little town/camp of Darlot with its four or five stores looked to be a failure. Then it bounced back in a moderate way in 1897. Mr Christy and party, owners of the Saint George mine, at Lake Darlot, report having just struck a rich lode. Over 50oz of gold has been dollied during the last two days. This event came soon enough to restore interest in the little town, but not much else had happened by the time of Kenneth’s birth in 1900. Herbert and Alice took their baby son and headed off – on camel back maybe? They purchased a mine and leased the Ballangarry Hotel in Lake Darlot. Herbert worked the mine, Alice ran the Hotel, which in the Australian style was more of a boarding house which provided meals and drinks. Initially, Alice was one of only four white women in the town but after a year or so the number was up to 25. I learned on this trip that she used to keep a shotgun beside her while she did her washing. It takes a great deal of courage to live under such circumstances. A coach carrying mails connects us with Lawlers, arriving here on Saturday and returning on Monday of each week. A weekly conveyance also connects us with the head of the railway at Leonora. This is a great help to our district, as both passengers and luggage reach us much quicker than by the other route. The Ballangarry Hotel, kept by Mr and Mrs Dunstall, is substantially built and conducted in an up-to-date manner. The daily requirements of our district are supplied by Mr John Dillon, who has just completed the erection of a large grocery and drapery establishment … and by the new bakery establishment of Mr Stephenson, while fresh meat is supplied by the firm of Messrs Gilmore and Pearce. I will here state that the population of Darlot and district is estimated at 200 adults, inclusive of about 25 ladies …. The town was growing. I have learned that Ken played with aboriginal children from whom he learned a great deal. We know he learned how to travel in the heat and what you could safely eat and what you couldn’t. He told one of his children that sometimes at night they could hear corroborees in the hills and that it was one of the most haunting and emotive sounds he had ever heard. I learned that Ken would never allow a harsh word against aborigines and had a great deal of trust in them. One mile south-east of the town is the Ballengarry lease, 12 acres. Several shafts have been sunk, all to water level. One is 110 feet; water level is 60 feet. From 1,732 tons crushed 889 ounces of gold were produced. Four men are employed, and they are stoping out stone. Messrs Smith and Dunstall, the holders, surrendered a portion of the surface for the State battery. In 1907, when Ken was seven years old, his father was killed in a mining accident. Alice continued to run a boarding house at Lake Darlot and married her second husband, an engineer called Percy Bisset, a year later when Ken was eight. Although she had remarried in 1908, Alice’s only child with her second husband was born in 1912. Ken was sent to Scots College (Scotch College) in Perth, Western Australia for his high school years. His stepfather wanted him to become a jeweller, but Ken had his heart set on mining, like his father before him. We don’t know the full story here, but we do know that Percy Bisset was a rather strict man and perhaps he refused to countenance Ken’s desire. He had a point, as the head of the Leonora State Battery he must have seen more miners go bust than succeed, or end up crippled by accidents. 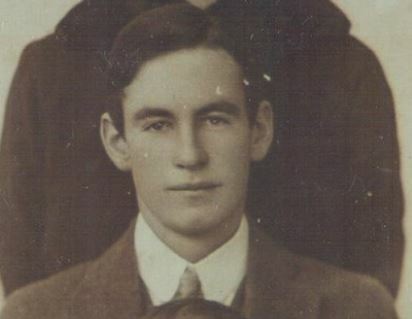 When Ken finished school he returned to Leonora or Lake Darlot, and joined the Goldfields Army Reserves in August 1918. He was accepted but the end of the war came before he began training. He told his children stories of walking for miles, but there is nothing concrete. He walked for eighty miles to see a girl he liked and found her with someone else. He found a loaf of bread on Christmas Day in a bush while tramping a long distance, after not having eaten for over 24 hours (one version is he found Christmas Pudding). Another story is that he walked to Perth, then took a job on a steamer to reach the Eastern states. However, there is some evidence that the story is muddled. Passenger reports show him returning to Fremantle from Darwin by the steamer Bambra, as a passenger in 1926. It is possible that he worked his way up. When this was or what he did in Darwin is not yet known. In 1928, Ken is found in another passenger list, heading by train from Perth to Kalgoorlie, probably on his way to Leonora. In 1929 Ken is near Geraldton applying for a license to run a mine called Retaliation. In 1934, I have found him as a passenger on the Great Western Express travelling overland from Perth to the eastern states. The family has a story about him being in Sydney, as a companion (business or otherwise?) to a lady who ran a boarding house. The story is that her boarding house was in the area which a few years later became King’s Cross. In 1935, Ken called for tenders to build a house at Mannus, New South Wales – the family home of his future wife Dulcie Peard. 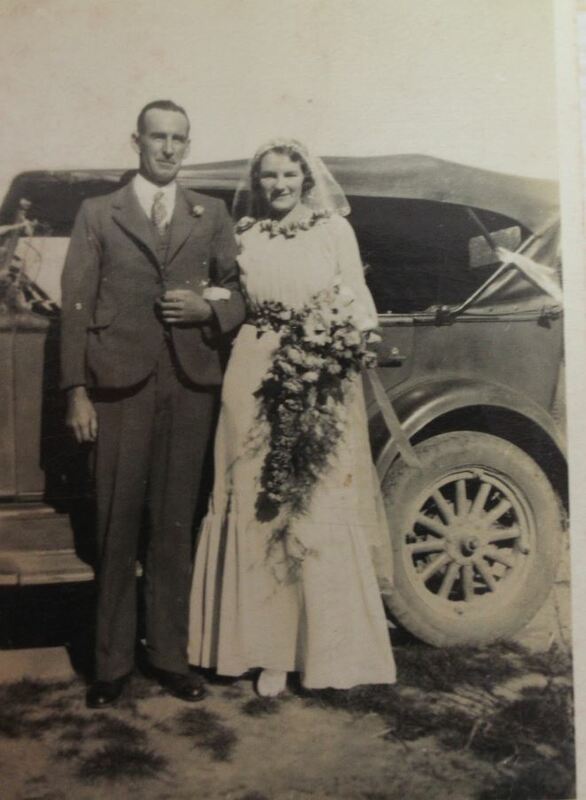 My grandparents Kenneth Dunstall (died 1991) and Dulcie Peard (died 1948) at their wedding in 1936. The couple who I hope to ‘get to know during this expedition. In 1936 Ken and Dulcie were married, but they did not settle in Mannus. Instead, they moved to Melbourne. The more recent years involve too many living people for me to easily blog about it, but there are still many mysteries to be uncovered. He seems to have tried a great many enterprises, few of which succeeded for reasons beyond his control, but perhaps there are more facts than we have uncovered. He was a somewhat religious man, a very responsible father and husband who tried to instil his values in his family. He was in his sixties when his younger children were born, so their generation was quite different to his. He managed to purchase his own home with some acres attached. He managed to support a very large family and keep them all healthy. He is remembered very fondly by them all and I learned a great deal from their obvious respect for him. Photos are few and far between. The search continues. Ken aged about 85 years in his house at Watchem. 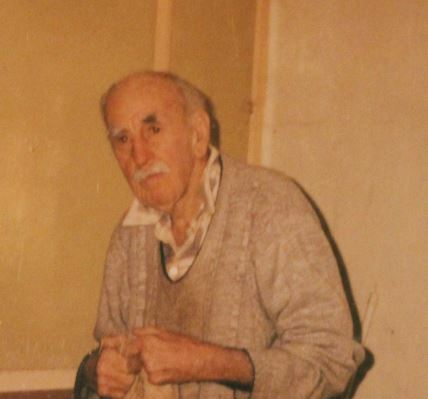 One last thing that I learned – Ken’s final home was the small town of Watchem, and he was buried at Burchip in rural Victoria. These towns were very close to Donald which I drove through on my way to Wangaratta. I’d come within 50km of his grave and didn’t know! So of course, I altered my route home to take me through those towns. The grave from a little further away.